Sollich, Model TC 1200D, 12 plate, chocolate tempering system. Rated up to 1,200 kg (2,645 pounds) per hour – depending on materials, application and machine configuration. Equipped with a (12) plate tempering chamber, water jacketed, scrape surface agitated zones, top and side 2½"OD / 2"ID Tri-clamp product ports and modular water flow system. Control panel with an AB controller and AB PanelView controller. Mounted on (4) leg stainless steel base frame. Bepex Model DMW1000, 9 plate, self contained chocolate tempering system rated up to 1000 kg or (2,200 lbs) of product per hour and pressure rating to 6 bar – depending on materials and application. Equipped with 40" wide x 60" high inner tempering chamber with (9) water jacketed plates and scrape surface agitation with top mounted temperature gauge, 2-1/2" OD threaded top and bottom product inlet / outlets, modular flow water system with filters that allow heat transfer through the surface area of the tempering unit and has maximum water flow of 5.5 square meters per hour, with shell volume of 45 liters and tube volume of 20 liters. Enclosed chamber system has (5) Omron digital temperature controllers, and water pump, heaters, main motor, chocolate pump, extra heating and pilot plant on / off switches. Mounted on heavy duty base frame. Sollich Model 12 plate, chocolate tempering system rating is depending on materials and application. Equipped with 20" OD x 44" High tempering chamber with (12) 20" OD x 3-1/2"High water jacketed scrape surface agitated plates. Top product port with flanged bolt down cover has (12) 5/8" bolts on 6-1/2" centers and 6" OD flanged product port with top mounted motor drive. 1" side water and product circulation piping and bottom product pump and 1, 2, 3 zone hot water, tempeture water suppy and tempeture water return insulated pipes. Mounted on painted base frame with clear plastic enclosed cabinet. Aasted, Model 4000, 18 plate, chocolate tempering system rated up to 4,000 kg (8,200 lbs) per hour with maximum pressure rating of 6 bars – depending on materials and application. Equipped with 24" OD x 48" High tempering chamber, with (18) 24" OD x 2-1/2" high water jacketed plates, scrape surface agitated zones with flanged bolt down cover has (24) ½" bolts on 4" centers with top 8"OD / 6" ID flanged top port with 1/2 bolts on 6" centers and bottom 3-1/2" ID product port and side 1/2" OD and 3/4" OD water circulation piping with bottom motor drive. Mounted on 40" x 32" (4) leg heavy duty platform frame. Aasted, Model 2000, 16 plate, chocolate tempering system rated up to 2,000 kg or 4,400 lbs per hour with maximum pressure rating of 6 bars – depending on materials and application. 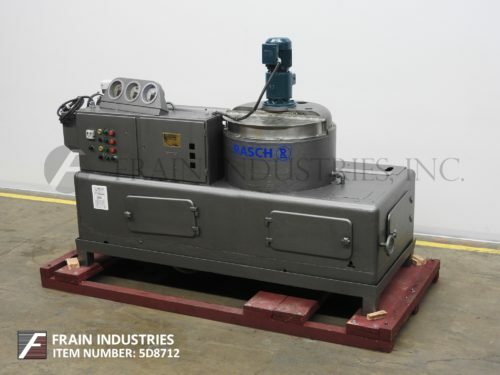 Equipped with 18" OD x 44" H tempering chamber, (16) plates, 18" OD x 2-1/2" high water jacketed plates, scrape surface agitated zones and flanged bolt down cover with (24) ½" bolts on 3" centers and top 8"OD / 6" ID flanged top port with (8) 1/2" bolt holes on 3" centers and bottom 3"ID bottom product port and side 3/4" ID side water circulation ports and bottom 15 Hp motor drive and has on / off power switch. Mounted on 40" x 36" (4) leg platform frame. Aasted Model DWM3000, 14 plate chocolate tempering system rated up to 3000 kg or (6,600 lbs) per hour with pressure rating to 6 bar – depending on materials and application. Equipped with 24" OD x 40" High tempering chamber with (14) 22" OD x 2-1/2 High water jacketed plates with scrape surface agitation. Flanged bolt down cover with (28) 1/2" bolts on 3" centers and bottom 3" ID Threaded and 7-1/2" OD flanged product port with (4) 3/4" bolts on 4-1/2 cenetrs and 3/4" side water circulation system piping with filters that allow heat transfer through the surface area of the tempering elements. Enclosed chamber system with power, agitation, pumpand heating valve on / off controls and has capablity of 6 temperature zones using (4) with watlow heat controllers and bottom motor drive. Mounted on (4) leg base frame. Aasted, Model 1000, 9 plate, chocolate tempering system rated from 100 kg to 1000 kg per hour with maximum pressure rating of 6 bars – depending on materials, application and machine configuration. Equipped with 18" OD x 24" H tempering chamber, (9) plates, water jacketed, scrape surface agitated zones with bottom mounted motor drive and 1¾" NPT top / bottom product ports . Mounted on (4) leg base frame with leveling pads. Chocotech, Model TP 10, chocolate tempering machine with pump. Rated from 200 to 1000 lbs of product per hour – depending on materials and application. Tempering unit equipped with 2½" OD / 2" ID tri-clamp product inlet at 85" in height, 6½" OD / 2¼"ID 4-bolt pattern flanged product outlet at ground level, 1" cooling water connection, 1" water drain connection. Tempering unit powered by 4 Hp drive. Includes digital temperture display for product and cooling water, variable speed dial for pump, forward / reverse pump switch and off / heat / rapid heat switch. Mounted on (4) leg frame base. Includes a 1½ Hp pump with 6½"OD / 2¼"ID 4-bolt pattern flange inlet and outlet at ground level.